This ruby-tailed wasp image by Levon Biss hangs in the hallway at the entrance to the Bohart Museum of Entomology. When you visit the Bohart Museum of Entomology at the University of California, Davis, that's what will greet you at its entrance. 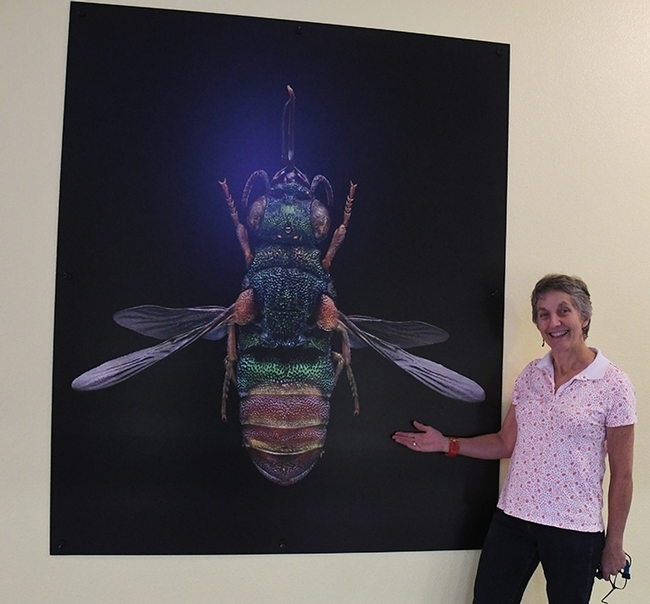 It's a huge microsculpture of a cuckoo or emerald wasp, the work of noted British photographer Levon Biss and graces the entrance to Room 1124 of the Academic Surge Building on Crocker Lane. 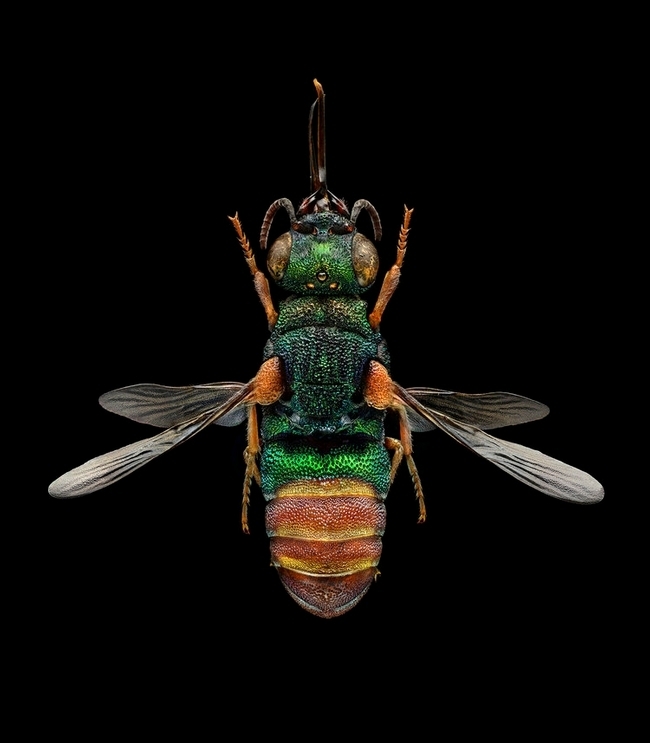 The 5x6-foot photographic image dwarfs its real-life counterpart, Parnopes grandior, commonly known as the “ruby-tailed wasp,” which measures 1.2 centimeters or about 0.5 inches in length. Visiting scientists, schoolchildren and the general public who enter the door to Room 1124, Academic Surge Building on Crocker Lane, are marveling at Biss's intricate work, which encompasses more than 8,000 separate images, said Lynn Kimsey, director of the Bohart Museum and professor of entomology at UC Davis. The ruby-tailed wasp image may rival Dorothy's ruby slippers in the Wizard of Oz. Chrysidid wasps are renowned for their highly sculptured, brilliant metallic colors. The “cuckoo” name refers to the fact that the female lays her eggs in the nests of unsuspecting hosts, including the sand wasp, one of its major hosts. Its larvae consume the host eggs, larvae and the stored food. “It's a European species, found throughout Europe but not here in the United States,” Kimsey related. The wasp, most diverse in arid regions, prefers dry and sandy soils in subtropical and Mediterranean climates. These wasps, are "famed for their bright colors," says Biss, who says this particular insect came from France. "Also known as cuckoo wasps, most species are parasites of other solitary wasps or bees. The exoskeleton is heavily sculptured with indentations and extremely tough, providing effective armor against the stings of their hosts." Members of the Bohart Museum Society funded the wasp image project, part of the museum's major redesign, which includes new signage, graphics and paint in the hallway. Biss, based in London, works across many genres, including news, sports, portraiture and insects. He developed his interest in insects after his son, Sebastian, found a ground beetle in their backyard. He photographed it and other insects, showed them to the Oxford Museum of Natural History, and gained access to the museum's historical collection of insects, including some collected by Charles Darwin. The British photographer launched a world gallery tour of his images two years ago; the show is now at the Houston (Texas) Museum of Natural Science, July 13, 2018 through Jan. 13, 2019. Richard “Doc” Bohart (1913-2007), former professor and chair of the UC Davis Department of Entomology (now the Department of Entomology and Nematology), founded the Bohart Museum of Entomology in 1946. He was an authority on the family Chrysididae, which includes more than 3000 described species. During his 32-year academic career, he identified more than one million insect specimens, many of which are housed in the museum that bears his name. Today the museum, dedicated to teaching, research and public service, houses nearly eight million specimens, collected throughout the world. It also includes a live “petting zoo” of stick insects, Madagascar hissing cockroaches, tarantulas and praying mantids, as well as a year-around gift shop. The museum is open to the general public Mondays through Thursdays, from 9 a.m. to noon and from 1 to 5 p.m., plus occasional, weekend open houses​. The next weekend open house is from 1 to 4 p.m., Sunday, Nov. 18 and centers around urban entomology. Further information is available on the Bohart Museum website at http://bohart.ucdavis.edu/ or contact (530) 753-0493 or bmuseum@ucdavis.edu. Hmm, What's That Critter with the Long, Skinny Necks and Legs? “They have weird, long, skinny hinged necks, long skinny legs, and the wing bases are covered by a structure that looks like a large hub cap." What's that critter, as described by Lynn Kimsey, director of the Bohart Museum of Entomology and professor of entomology at the University of California, Davis? A cuckoo wasp, and a rare one at that. "Also, unlike most other chrysidid cuckoo wasps--which are lovely metallic blues and greens--they are flat brown," she says. "We have no idea how they make a living." 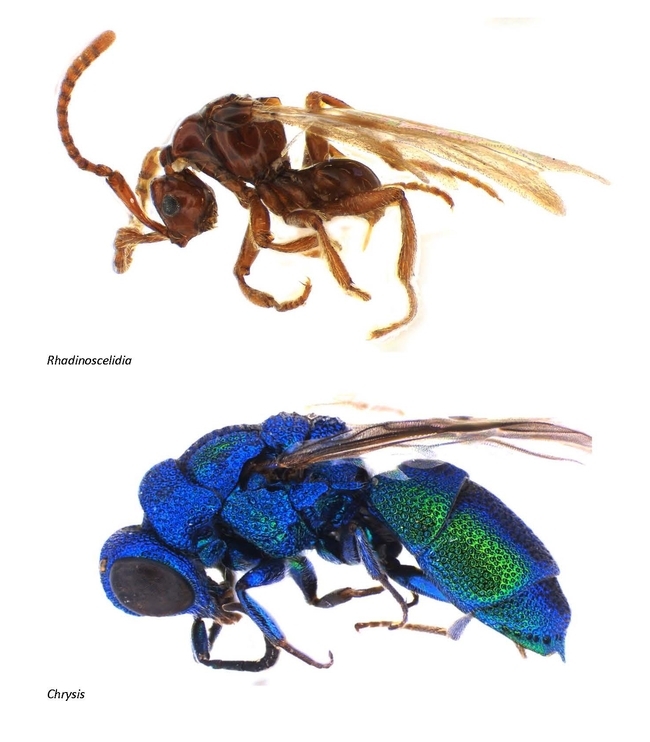 Kimsey has just published a journal article about that rare cuckoo wasp. “The genus, Rhadinoscelidia, is a very weird chrysidid--kind of if you wanted to create something too weird to be real,” she said. “Unlike other cuckoo wasps that lay their eggs in the nests of bees and wasps killing the unsuspecting hosts, these wasps may very well be parasites of walking stick eggs, like other members of their group,” Kimsey said. The paper, Morphology and Review of the Odd Genus Rhadinoscelidia Kimsey, 1988 (Hymenoptera, Chrysididae, Loboscelidiinae) is published in current edition of the Journal of Hymenoptera Research. To date, the genus is known only from Hainan Island (China), Thailand, Laos, West Java (Indonesia) and Malaysia (mainland). However, Rhadinoscelidia species probably occur throughout Southeast Asia, including Cambodia, Viet Nam, southern mainland China and Myanmar. 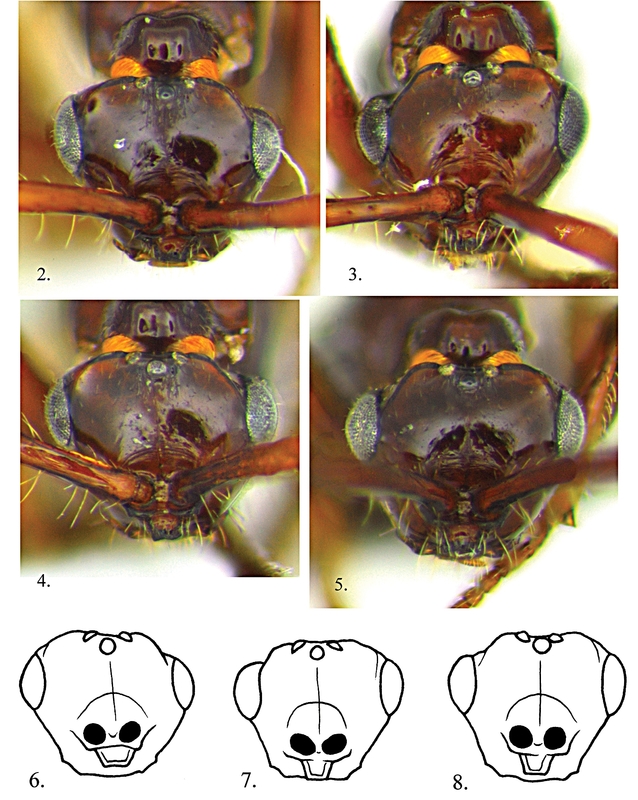 In the journal article, the professor described the new species, Rh.chaesonensis sp., and documented “peculiar deformations of the head” in one species, Rh. malaysiae Kimsey, 1988, from Thailand. Rhadinoscelidia is one of two genera in the subfamily Loboscelidiinae, characterized by antennae that appear to be inserted horizontally on a shelf-like structure in the mid-face, Kimsey said. This study was made possible by the efforts of Michael Sharkey's Thailand Inventory Group for Entomological Research (TIGER) Project and the collaboration of Zai-fu Xu of South China Agricultural University; Doug Yanega of UC Riverside; and David Wahl, American Entomological Institute. Kimsey, who administers the Bohart Museum of Entomology, which houses some eight million insect specimens, is a recognized global authority on the systematics, biogeography and biology of the wasp families, Tiphiidae and Chrysididae. A past president of the International Society of Hymenopterists and a member of the UC Davis faculty since 1989, she has authored more than 116 publications, and described more than 270 new species. Kimsey's areas of expertise also include insect include insect biodiversity, urban entomology, civil forensic entomology, and arthropod-related industrial hygiene. She shares her knowledge of insects by consulting with international, national and state agencies. She also identifies thousands of insects every year for scientific collaborators, public agencies and the general public; and annually answers scores of questions about insects from the news media and public. 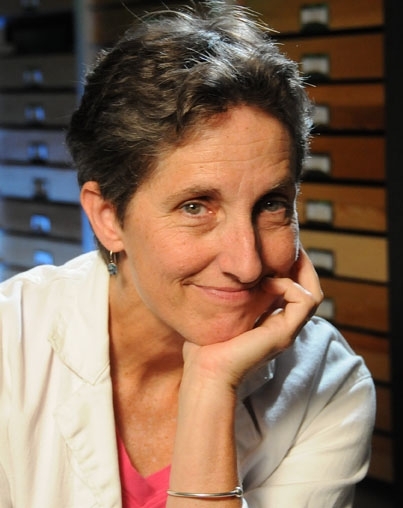 Kimsey received her undergraduate degree (1975) and doctorate (1979) in entomology from UC Davis, studying with major professor Richard Bohart, for whom the UC Davis insect museum is named. Heads of Rhadinoscelidia malaysiae species. "One of the most unusual things about these wasps is the weird head deformities," says Lynn Kimsey. 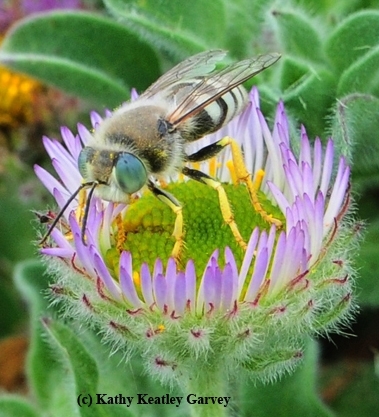 "I’ve never seen it in any other wasps or bees that I’ve studied."